How to Deal with Cutting Mistakes in Garment Manufacturing? This post is written to answer the question asked by an OCS reader. In a single sentence, mistakes in cutting department increases production cost per piece and the recovering process is always frustrating. is your cutting team incapable of doing certain things due to lack of training and knowledge? I have tried to make a brief list of the patterns of mistakes. 1. Wrong patterns: Pattern modification is not done based on fabric shrinkage report or FIT comments is not incorporated in production patterns. This kind of mistake majorly happens where there is no standard procedure of pattern marking and pattern handover to cutting department. This kind of mistakes can also happen due to carelessness cutting workers or having little knowledge about patterns and its effects in production. 2. Cutting a wrong size ratio: it might be a result of carelessness of the workers. 3. Fabric received without prior quality check and approval based on test report: Again this is a result of not following standard procedure of fabric issue to cutting department. Not making shade band for fabrics with shade variation. 4. Missing notch mark: Notch mark is not given at desired position of the pattern or there is notch mark in patterns but cutter miss to cut notches in fabric lay. This may be a result of carelessness of employees. 5. Numbering mistakes: Workers are not trained for the work or they are carelessness. 6. Following wrong cutting plan: Cutting plan sometimes doesn't match with the requirement of sewing department when cutting department doesn't work according to daily cutting plan. Or change of production plan might not be communicated to cutting in-charge. The above points are some common mistakes of cutting department but mistakes are not limited to these only. You might face other kind of mistakes. You can send us mail about the mistakes occur in your cutting department or write the same in the following comment box. How to deal with cutting problems? Study the frequency of mistake occurrences. Pick top 3 major mistakes first. Find root causes of the mistakes. Work on removing the root cause from the process. I know this smart answer would not work for you. You need step by step guides. Right? Continue reading for the possible solutions. Keep a check point for checking garment patterns before issuing pattern to cutting department. You can develop couple of samples prior to bulk cutting based on production pattern. I mean cut fabric with patterns --> sew garments --> finish garments and check the quality. 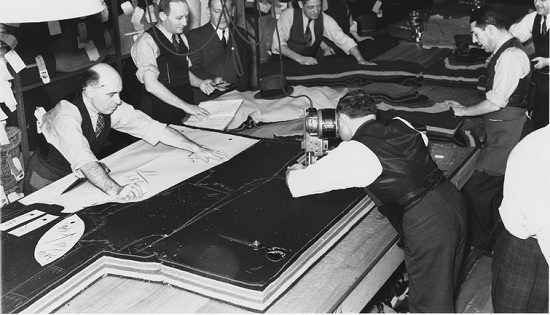 If you found variation in finished garments then correct it prior to bulk cutting. If you religiously make pre-production (PP) samples and check the samples according to buyer specifications, you would not get surprise things like - measurement issues and fit problems in bulk production. Numbering of pattern pieces should be done (like pattern piece number 02 of 16 or number 03 of 16). Clearly mention on patterns whether fabric to be cut in folded form or in open width. How many components to be cut for single pieces from a single pattern piece. Like for shirt cuff patterns, four component needs to be cut where cutting department get one pattern piece for cuff. Pilot production run is the solution. You might do Pilot Run prior to bulk cutting. If you do this process then all problems exist in cutting process, whether it is fabric issue or pattern issue would come out in the pilot run pieces. You might loss some fabric in this process but not the whole fabric. All cutting defects can been taken care of by setting quality check point for layers and cut components. Also check shorting and bundling activities. Like size mixing and ply mixing possibilities. Companies follow different procedures for cut planning. In most companies, cutting department gets weekly cutting schedules and if there are changes on existing plan, cutting department gets updated plan. Still there may be some communication gap between cutting department and production department. This kind of issues can be controlled by having daily morning meeting between core production departments in a factory. Solution can be simplified by following standard procedure of cutting activities. If you have not yet developed standard operating procedure (SOP) for cutting room activities, develop it and ensure that everyone in cutting department follow the standard working procedures. To make it further error proof, set standard procedure for fabric department and sampling and pattern making department also. It would be great learning for me if you also share your methods about how do you deal with mistakes occurred in cutting room? Do you find this guide helpful? Share it with your fellow colleagues and spread good ideas. Online Clothing Study: How to Deal with Cutting Mistakes in Garment Manufacturing?